Weeds to some but wildflowers to the more romantic among us – I love them. 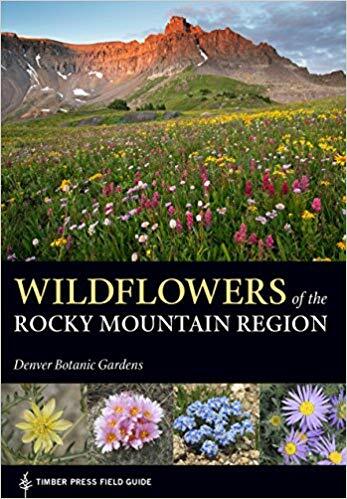 That is why I was so happy to accept Wildflowers of the Rocky Mountain Range by the Denver Botanic Gardens for review at no charge for my honest review. Wildflowers of the Rocky Mountain Region—from the Denver Botanic Garden, the region’s recognized leader in horticulture—describes and illustrates more than 1,200 species commonly encountered in Colorado, Utah, Wyoming, Idaho, Montana, and the northern parts of Nevada, New Mexico, and Arizona. This comprehensive guide includes perennials, annuals, and bulbs, both native and naturalized, and is organized by flower color and petal shape. Introductory information includes an explanation of the plant parts, keys to the plants, and information on plant names. Species profiles include color photographs and range maps. This is a beautiful and comprehensive book that is easy to toss in a backpack for when you go on a hike to hike to help identify the wildflowers you encounter. Of course in this day of digital photography you can also take a photo and come back and search if you don’t need to know RIGHT NOW! The photos are clear and help you see the small things that let you figure out one flower from another. There are some instances where the flower field is shown instead of the the unique flower and this can make identification a touch challenging but these are limited. It’s a pleasant book to page through as well. I mean who doesn’t like looking at photos of colorful and pretty flowers?